The conference office has provided below a range of hotel and self-catering apartment options near the conference venue at the Convention Centre Dublin. To take advantage of the special rates, your booking should be made online at the time of registration through the conference registration booking site. 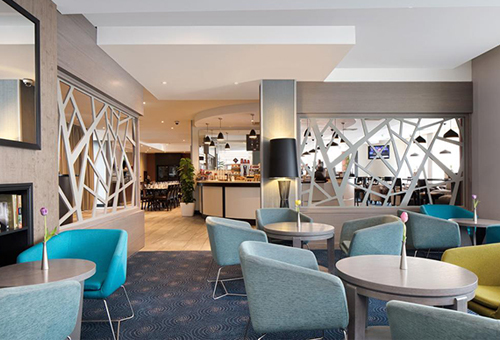 The Conference Headquarter Hotel, the Gibson Hotel is ideally situated in Dublin just 15 minutes direct from Dublin Airport, at the end of The Port Tunnel. 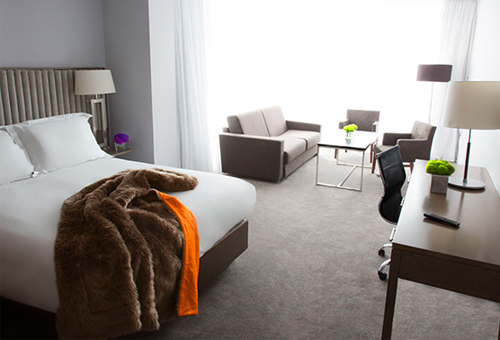 Guests can be anywhere in minutes, with the LUAS tram stopping right on the hotel’s doorstep. The Aircoach stops directly outside the hotel. Being within walking distance from the Convention Centre Dublin the Gibson Hotel is the ideal choice for your stay during FENS 2019. Some of the features of the hotel include complimentary high-speed Wi-Fi, access to gym and relaxation rooms, the Coda Eatery and Hemi Bar. The spacious rooms are beautifully designed with a modern, light and airy décor and floor-to-ceiling windows. The air-conditioned rooms feature flat-screen and some have private balconies with city views. FENS delegates enjoy 10% discount in the Hemi Bar which offers a mix of pan Asian and European dishes and speciality cocktails. 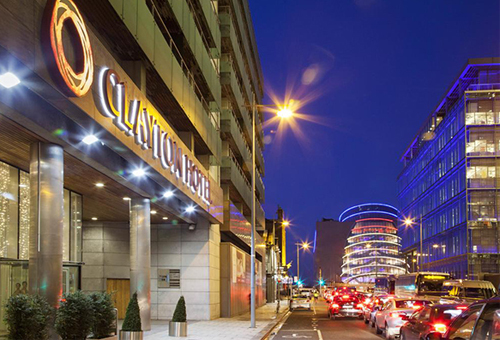 Clayton Hotel Cardiff Lane is located in the heart of Dublin Docklands within walking distance of several iconic venues including The Convention Centre Dublin (5 minutes), Bord Gais Energy Theatre (2 minutes), 3Arena (15 minutes), Aviva Stadium (25 minutes) and Croke Park (25 minutes). As a hotel in Grand Canal, it’s ideally located only 12 kilometres from Dublin airport, walking distance to Connolly or Pearse Street train stations and close to Luas (Tram) line services at Mayor Square. 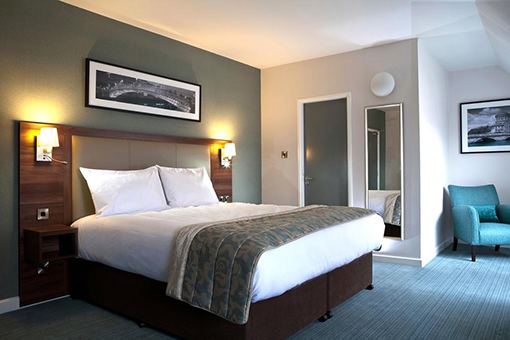 Clayton Hotel Cardiff guest rooms feature a flat screen plasma TV, 24 hour room service menu and an in room safe with sufficient space for your laptop and personal belongings. All rooms offer en-suite facilities, complimentary WiFi and tea and coffee making facilities. Guests can make use of Club Vitae’s 22m swimming pool and fully-equipped gym. Unwind in a spacious room with large, comfortable beds, a 40-inch HDTV, mini-refrigerator and laptop safe. Get work done with complimentary WiFi in your room while seated at the workstation with ergonomic chair. Dine at Oly’s Bar & Restaurant, the on-site bar and restaurant. Food is served throughout the day until 10pm with options for breakfast, lunch and dinner. As well as fully equipped cardiovascular gym and Scandinavian Saunas, (which are exclusively available only to guests) The North Star Hotel facilities also include the newly launched McGettigans Cookhouse & Bar. It promises the perfect ambience for every dining experience with a focus on modern Irish cuisine using only locally sourced ingredients. A perfect city retreat boasting exceptional convenience to the city’s prime venues and attractions, The Address at Dublin 1 offers a unique experience for a hotel stay in the heart of Dublin city centre. The Address at Dublin 1 has 72 luxurious club rooms, the award winning McGettigans Cookhouse & Bar as well as access to an exclusive rooftop Club Lounge boasting enviable views overlooking Dublin’s skyline. 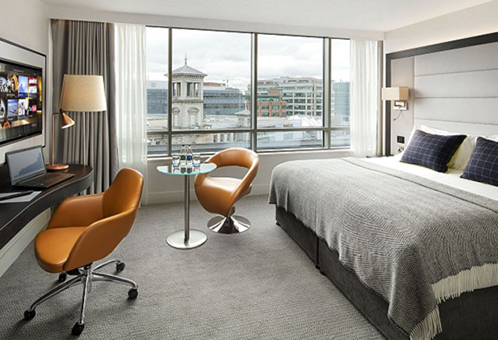 The Address at Dublin 1 is located in the heart of Dublin’s business district, the International Financial Services Centre (IFSC), and a short stroll away from The Convention Centre Dublin making it an ideal location for the corporate traveller. The Hotel is easily accessible by all public transport routes, with Luas / Tram, Train and Central Bus Station within meters. Dublin Airport is only a 10 minute drive through the Port Tunnel. Trinity City Hotel is a 262 room, stylish hotel in the heart of Dublin City Centre, just a few minutes stroll from Grafton Street, O’Connell Street, Temple Bar and St Stephens Green. 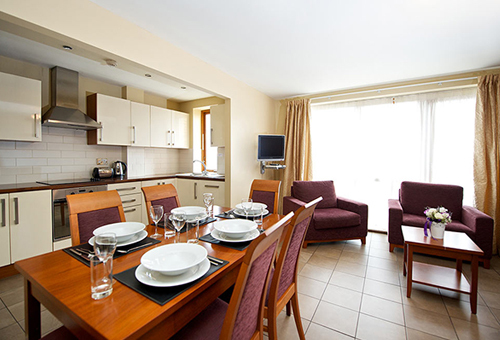 Its ideal location, on Pearse Street, Dublin 2, allows for a peaceful stay while still being close to the action. The world-famous Trinity College is on your doorstep, while the IFSC, Dublin Convention Centre, Dublin Castle, the Silicon Hub and Grand Canal Docks are only a short walk away. With 262 Guest Bedrooms at Trinity City Hotel, ranging from Classic, Superior, Deluxe and Executive, to the striking Executive Suites and Georgian Suites, Trinity CIty Hotel offers stylish, relaxing surrounds for business or leisure. Old meets new at Trinity City Hotel, where original Georgian features and historically unique buildings mix with stunning art work, adventurous colour schemes and deluxe furnishings. Exposed brick walls, high ceilings and vintage glamour make Trinity City Hotel a special place. 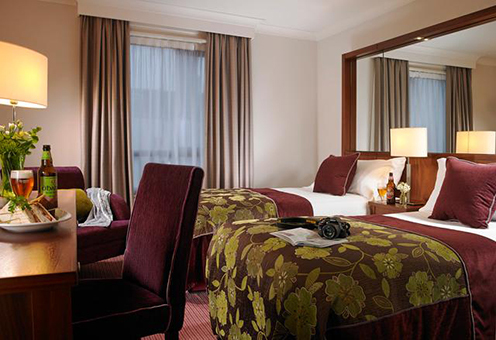 The Grand Canal Hotel in Dublin City boasts 142 comfortable & beautifully decorated bedrooms. 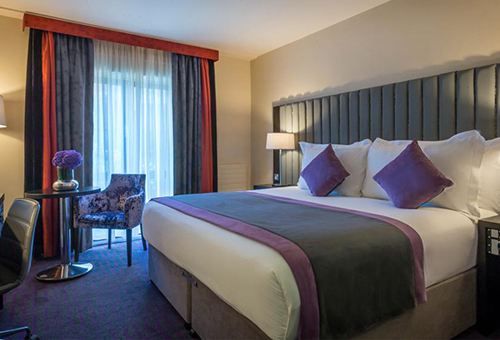 The 4-star, family owned hotel is close to everything with the Bord Gais Energy Theatre, Grafton Street, Trinity College, IFSC, Convention Centre Dublin, Aviva Stadium, RDS Arena and the area of Ballsbridge all located within walking distance. The Convention Centre Dublin can be reached in 15 minutes by foot or you can take the DART (train) from the Grand Canal Dock Station which is located directly opposite the hotel. Each guest bedroom is a haven of comfort and relaxation ad features high-speed WiFi, smart TV with internet connection, Lavazza coffee machine and much more! Whether you are looking for a relaxing break or want to explore all that the city of Dublin has to offer, come and stay at the Grand Canal Hotel. The Hotel Rui Plaza The Gresham Dublin is located in the heart of Dublin city centre and is one of the best known hotels in Dublin. 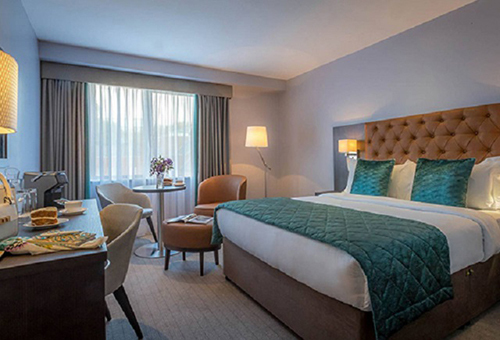 This recently renovated 4 star hotel is located on Dublin‘s main thoroughfare, O’Connell Street and is 8 mins by foot and tram to the conference venue, The Convention Centre Dublin (CCD). 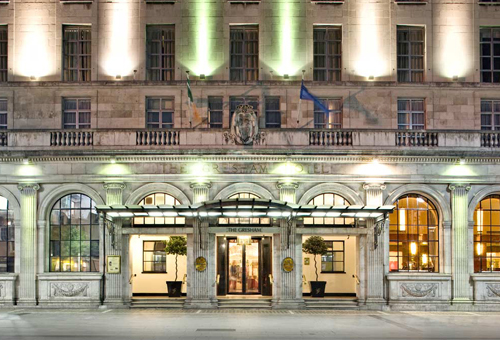 This grand hotel is a landmark building with original period features including stunning Waterford crystal chandeliers. Each of the hotels 323 bedrooms and suites are equipped with complimentary WiFi. The Gresham Dublin is easily reached from Dublin Airport - take any Aircoach to O‘Connell St. ( Gresham Hotel Stop) or the 747 bus to O’Connell St. Both of these options stop outside the front of the hotel. If you’re staying in the Irish capital, you’ll be on the lookout for a conveniently located hotel close to some of the biggest and best sights in the city. The Parnell Street Hotel is not only near the historic O’Connell Street, but is part of the most vibrant and exciting area of Dublin. Jurys Inn Dublin Parnell Street is less than a five minute walk from Henry Street shopping district and a short walk from Trinity College Dublin and Grafton Street. The Convention Centre Dublin can be reach in 20 minutes by foot or in just under 20 minutes via the LUAS tram - the LUAS stop Abbey Street is located 5 minutes from the hotel. All bedrooms feature free WiFi, en-suite bathrooms with complimentary toiletries and satellite TVs. Jurys Inn Dublin Christchurch is just a short walk from the city’s many cultural gems, perfect for an unforgettable stay in wonderfully vibrant Dublin. The hotel is located opposite Christ Church Cathedral and close the popular Temple Bar, where you’ll find some of the city’s very best food, drink and entertainment. The city’s shopping area, Grafton Street, is only a 10 minute walk away from the hotel. A direct LUAS (tram) connection will get you to the conference venue, the Convention Centre Dublin within 20 minutes. The closest LUAS stop to the hotel is Four Courts (5-minute walk). Jurys Inn Christchurch has a Costa coffee bar, so you can get a much-needed pick-me-up to get your start your day right. 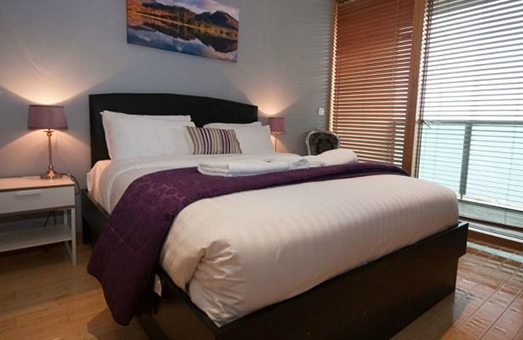 All rooms include free WiFi, en-suite bathrooms and multi-channel flat screen TVs. 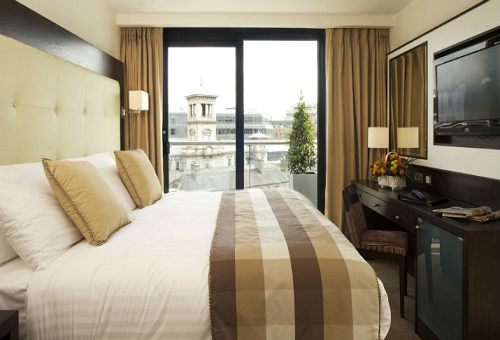 The Camden Court Hotel boasts an envious location in the heart of Dublin’s City Centre. It is within walking distance from some of the city’s top landmarks such as Trinity College, St Stephen’s Green and the National Concert Hall. The Convention Centre Dublin can be reached via a direct bus link in 20 minutes (The No. 15 bus stop is located 5-minute walk from the hotel). The LUAS (tram) stop Harcourt Street is located directly opposite the hotel. This Dublin City Centre 4-star hotel offers an array of complimentary extras such as access to the Leisure Centre and high speed Wi-Fi. The Leisure Centre has a 16 metre swimming pool, Jacuzzi, sauna, steam room and fully equipped gym. 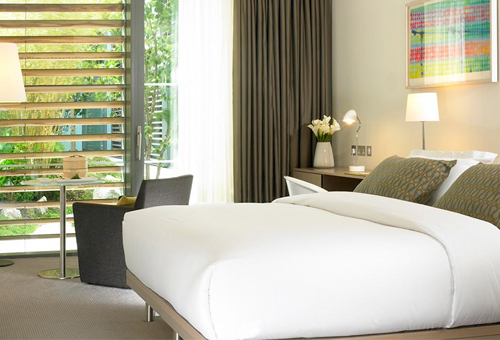 The fresh and contemporary bedrooms include high standard amenities and the addition of flat screen Smart TV’s, in-room safety deposit boxes and en-suites with Orla Kiely toiletries. 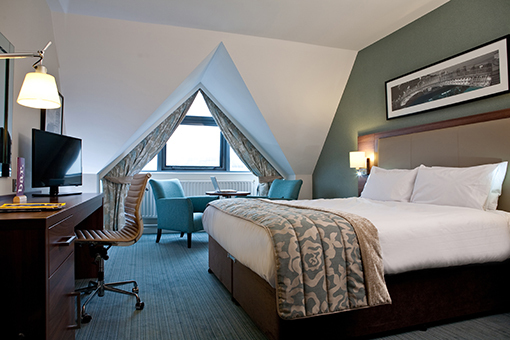 Whatever your requirement, Camden Court Hotel in Dublin is ideal for both business and pleasure. The IFSC Dublin City Apartments by theKeyCollection are located throughout the IFSC & Docklands area. The congress venue at the Convention Centre Dublin is 450m from the property. Each apartment has been refurbished to the highest standard and offers fully fitted kitchens with tea and coffee making facilities, dining & living areas with flat screen TV’s. Every unit comes with a private bathroom with free toiletries. Towels and bed linen are included and a concierge is on hand 24/7. Every apartment features free WiFi. If you’re visiting Dublin city, there’s no better place to be than right in the city centre – which is why Staycity’s serviced apartments at Christchurch are a brilliant option. The Christchurch Aparthotel is just 10 minutes from Dublin’s main shopping district, Grafton St, and directly on the tourist trail – with Dublin’s open-top bus tours stopping mere minutes from the front door. Staycity serviced apartments offer the perfect alternative to hotel accommodation, combining all of the services you’ve come to expect from your luxury stays – 24-hour reception, any-time check-in and clean towels and bed linen – with the comforts of home, to truly allow you to relax and enjoy your stay. Put your feet up in your living area in front of the flat screen TV and prepare your breakfast in our fully equipped kitchen. From the airport, take the 747 bus from Dublin airport as it will bring you to within a two-minute walk of the property. The Convention Centre Dublin can be reached with the LUAS tram in just 20 minutes. Take the LUAS from the Fourt Courts stop which is located within short walking distance from the apartments.